Crafting With Craig: Little bit of Leonie Love. Little bit of Leonie Love. Can't believe this, I'm actually blogging........again. I know I say each time but I really need to get into the habit of blogging with full details. I do enjoy blogging but like anything in life, it's the sitting the down and doing it. Suppose the good thing this day and age is it can be done not just on a laptop or pc but the trusted iPad and my iPhone come in handy. So that being said, what better range and card to start a new season of blogging with other than Leonie Pujol brand new range of Masks and Stencils that have been produced for her by Crafters Companion. I love the idea and concept of Leonie's new range of building a design and/picture to create your projects. It's all about building layers and given definition. The first one I chose to use was "Love" mask. I chose to use just 2 sets of stamps and to have the main background colour red - of course red and love go together. - I took a piece of Hunkydory crafts "Ink me" card stock and cut it to 6"x6" in size. - I placed my "love" stencil in the middle using a temp adhesive by Crafters Companion - Stick and Spray. - I stamped my design first. Most of which was random but some were specifically stamped in place. - When I was happy with how it looked I Placed low tack masking tape by Stix2 round the edges of the card stock. - Using a round blending tool, I dabbed the colour over the stamped design, leaving the "Love" mask in place. Most of the colour used is Fire Brick but over the "Love" I have also used some Mustard Seed too. - I took my chosen Promarker colours and coloured in certain elements of the design. The colour won't be as bold as the distressed colour underneith with dilute the colour strength. - Before removing the "Love" mask I have drawn round it with a grey Promarker pen. This will give it a slight shadow effect. - I Then peeled off the low tack masking tape to unveil the finished design. Next, I mattet and layered it onto a piece of Black card stock by Bazzill Basics and added 3D foam pads to the back. - For the background I chose a piece of patterned paper from a 12x12 paper pad I bought in Michaels store in New York City last year. I trimmed it down to 7 3/4" X 7 3/4"'and matted it onto a piece of black card stock. I then attached it to my 8x8 card blank. - To finish off I added a few black gems in the corners. 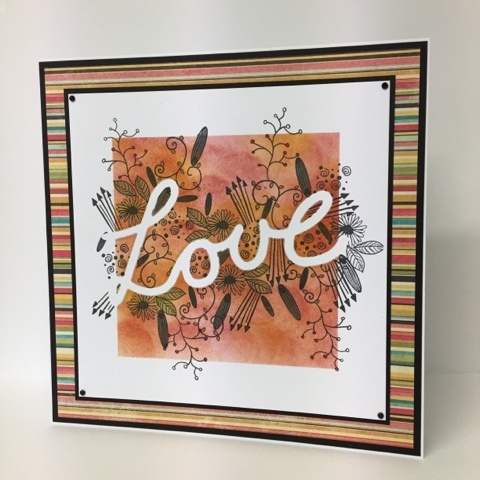 I had so much fun making this card and can't wait to get creating again using lots more of the stamps, masks and stencils. They are so versatile and can be used to create simple cards or very detailed cards and projects. Lovely card Craig, I am glad you put it on your blog as it's great to read how you did it. Thank you, your more than welcome. I really need to get into blogging more. Sit down with cuppy and blog. It's remembering to take pictures as I'm making the project I forget to do lol.